The renin-angiotensin-aldosterone system (RAS) is a widely known regulator of BP and a determinant of target organ damage. Angiotensin II, the main effector of RAS, is a key mediator of renal injury by increasing intraglomerular capillary pressure and ultrafiltration of plasma proteins and by promoting cell growth and fibroproliferative effects. RAS blockade with inhibitors of RAS is beneficial in slowing progressive loss of renal function in chronic kidney disease. Experimental evidence also indicates that aldosterone, besides being a regulator of extracellular fluid volume and sodium and potassium balance, directly contributes to accelerate renal damage by sustaining cell growth, inflammation, and fibrosis. This occurs through production of growth factors and reactive oxygen species as well as inhibition of extracellular matrix degradation. Attenuation of growth-promoting and fibroproliferative effect of aldosterone may contribute to protection against progressive renal injury. Initial studies that detail the efficacy of aldosterone blockade in animals and humans are encouraging. Nevertheless, further studies in larger populations with longer follow-up are warranted to address more definitely the safety and renoprotective effect of aldosterone antagonism in chronic kidney disease patients. Worldwide, more than 60 million individuals are estimated to have some degree of chronic kidney disease (CKD),1 and the burden may double in the next 10 yr. The emergence of CKD as a major public health problem has placed increased pressure on the health care system to address this condition. Of particular importance is that CKD represents a major risk factor for cardiovascular disease and seems to be a potent risk multiplier, particularly in those with diabetes and hypertension. Progression to ESRD is common in chronic nephropathies. Hypertension and proteinuria are major determinants of renal progression and contribute to glomerulosclerosis, interstitial inflammation, fibrosis, and tubular atrophy, the key morphologic components of progressive scarring of the kidney. The renin-angiotensin system (RAS) is centrally involved in this process, and angiotensin II, in particular, has received great consideration as the mediator of renal injury by increasing intraglomerular capillary pressure and ultrafiltration of plasma proteins and by promoting cell growth and fibroproliferative effects. Evidence suggests that decreasing proteinuria, regardless of its cause, is beneficial in slowing progressive loss of renal function and reducing the risk for ESRD. The most efficient ways to reduce proteinuria in CKD are BP reduction and inhibition of RAS. RAS blockade with angiotensin-converting enzyme inhibitors (ACEi) or angiotensin II receptor blockers (ARB) may decrease glomerular capillary hypertension that follows nephron loss2 and improve the glomerular sieving properties by mechanisms only partially depending on their hemodynamic effects.3 Both improved hemodynamics and sieving function may explain the antiproteinuric and renoprotective effects of RAS inhibitors in several animal models2 and in humans with diabetic or nondiabetic renal disease.4 Thus, clinical trials of proteinuric chronic nephropathies indicate that ACEi and ARB can postpone ESRD for several years and in a significant percentage of patients even avoid dialysis, yet there are patients who do not or only partially benefit from ACEi/ARB treatment and therefore risk progressive loss of renal function. Thus, a significant reduction of the future incidence of ESRD is likely to occur only if the degree of renoprotection can be improved or even remission/regression of proteinuric chronic nephropathies can be achieved.4 This goal may be attainable with a more complex strategy than with a single pharmacologic intervention with ACEi, ARB, or their combination. An additional key component of RAS is aldosterone—a mineralocorticoid hormone produced in the adrenal cortex, in endothelial and vascular smooth muscle cells in the heart, blood vessels, and brain. Since its isolation and characterization more than 50 yr ago,5 investigators have perceived aldosterone primarily as a regulator of extracellular fluid volume and sodium and potassium balance. Aldosterone increases sodium reabsorption in the distal nephron of the kidney by binding to the intracellular mineralocorticoid receptor that translocates to the nucleus, where it upregulates the transcription of genes encoding Na+/K+-ATPase and epithelial sodium channel subunits.6 It has also been shown to increase expression of the renal outer medullary potassium channel, which enhances potassium excretion by tubular cells,7 an effect facilitated by simultaneous aldosterone-induced Na+ reabsorption. In turn, aldosterone promotes volume expansion, thereby increasing BP. In recent years, however, there has been a striking paradigm shift with respect to our understanding of the widespread actions of aldosterone, besides the classical effects on sodium and potassium transport in the renal tubules, which point to a possible contribution of this RAS component to the development and progression of chronic renal injury. Nevertheless, investigators still favor aldosterone's ability to enhance systemic and intraglomerular capillary pressure as the major mode of damage to the kidney. Although the molecular pathways of aldosterone-mediated renal injury have not yet been fully elucidated, they all seem to contribute to the final common pathway of renal fibrosis. In vitro studies have shown that aldosterone significantly increases TGF-β and fibronectin production by mesangial cells in culture, an event abolished by the aldosterone antagonist spironolactone.11 Similarly, aldosterone infusion for 3 d in otherwise normal rats causes a more than two-fold increase in the urinary excretion of TGF-β.12 Moreover, uninephrectomized rats treated with aldosterone, in the presence of AT1 receptor blockade, show increased expression of TGF-β1 and mRNA encoding collagen.13 These findings indicate that aldosterone may have an independent role in renal fibrosis through TGF-β signaling pathways, which upregulates collagen synthesis, downregulates the release of the extracellular matrix metalloproteinase collagenase, and promotes fibroblast proliferation.13 Some of the profibrotic effects of TGF-β are actually mediated by connective tissue growth factor (CTGF), a member of the CCN family of early response genes, which stimulates proliferation of renal fibroblasts and induces extracellular matrix synthesis14; however, in cultured mesangial cells and proximal tubular cells, aldosterone significantly increases CTGF gene expression and protein synthesis even in the presence of TGF-β1 neutralizing antibody, suggesting a TGF-β–independent pathway for aldosterone-induced CTGF production.15 Moreover, in Osaka Long-Evans Tokushima fatty type 2 diabetic rats, spironolactone treatment markedly decreases renal CTGF and collagen synthesis. As in the heart, the mechanisms of aldosterone-mediated renal damage also involves induction of ROS and enhanced expression of inflammatory molecules. In rat mesangial cells, aldosterone directly promoted O2− generation by increasing NADPH oxidase activity and translocation of the cytosolic components of NADPH enzyme p47phox and p67phox to the cell membrane.16 Of interest, ROS production in proximal tubular cells induced by aldosterone leads to cell apoptosis.17 This provides a further mechanism through which ROS may allow aldosterone-mediated renal damage. The role of ROS is also underlined by the observation that in rats treated with aldosterone and given high-salt diets, ROS levels in renal tissue increase as well as the renal expression of proinflammatory cytokines osteopontin, membrane co-factor protein 1, IL-6, and IL-1β. This is in association with the development of glomerular injury—characterized by expansion of mesangial matrix and enhanced cell proliferation.18 When animals are given the antioxidant tempol or the aldosterone antagonist eplerenone, ROS levels normalize. Renal fibrosis is ultimately the result of excessive interstitial fibroblast proliferation and the unbalance between production and degradation of extracellular matrix components. Evidence is available that aldosterone promotes fibroblast growth and proliferation19 through activation of intracellular signal transduction pathways responsible for cell growth and differentiation that involve mitogen-activated protein kinases.18 This has been documented in aldosterone-treated rats, in which activation of mitogen-activated protein kinases was prevented by concurrent treatment with eplerenone.19 By interacting with angiotensin II, aldosterone also increases the expression of plasminogen activator inhibitor-1 (PAI-1), which is known to promote accumulation of extracellular matrix20 in endothelial cells. This signaling occurs through a glucocorticoid responsive element and serum-inducible element localized in the PAI-1 promoter.21 This effect of aldosterone was recently confirmed in rat mesangial cells in culture.22 The upregulation of PAI-1 expression by aldosterone, however, is independent of mineralocorticoid-induced increases in TGF-β1 expression and intracellular ROS production. Furthermore, aldosterone enhances renal mRNA expression of PAI-1 in wild-type mice.23 In a radiation model of renal damage, inhibition of aldosterone also downregulates PAI-1 expression in vivo, and local PAI-1 expression and sclerosis were linked tightly.24 Finally, serum aldosterone concentration correlates with PAI-1 antigen level in humans,25 further supporting an in vivo role for aldosterone in the regulation of PAI-1 as well. These collective observations support the hypothesis that aldosterone induces renal injury at least in part by enhancing PAI-1 expression, which tips the balance in favor of extracellular matrix accumulation, eventually promoting renal fibrosis. If aldosterone acts through production of growth factors and ROS and by inhibition of extracellular matrix degradation—important mediators of renal fibrosis—then blockade of the mineralocorticoid receptor should prevent or limit renal injury. This is what happens in animals given a nonselective (spironolactone) or a selective (eplerenone) aldosterone receptor antagonist. Spironolactone limits the development of glomerulosclerosis and tubulointerstitial fibrosis in rats with streptozotocin-induced diabetic nephropathy,26 in a genetic model of type 2 diabetes,15 in chronic cyclosporine-induced nephrotoxicity,27 in radiation-induced renal injury,24 and in the stroke-prone substrain of the spontaneously hypertensive rat.28 Similarly, in Dahl salt-sensitive rats, a model of hypertensive glomerulosclerosis, eplerenone prevents podocyte damage, proteinuria, and glomerulosclerosis.29 More important, inhibition of the aldosterone receptor also provides renoprotection in animals with established renal injury. In rats that had five-sixths nephrectomy—the remnant kidney model of sclerosis—and had already developed proteinuria and glomerulosclerosis, spironolactone induced regression of existing glomerular damage.30 Tubulointerstitial fibrosis and vascular lesions improve in parallel with glomerulosclerosis. The renoprotective effects of spironolactone potentiate when rats are given the aldosterone receptor antagonist in combination with the ARB. These experimental findings may have important clinical implications, because blockade of the aldosterone receptor is instrumental in protecting the kidney from further damage even in the presence of angiotensin type 1 receptor antagonism; however, whether this novel renoprotective approach would translate into clinical benefits for patients with chronic nephropathies remains unclear, because available data are scarce and mainly from uncontrolled or small, short-term, controlled studies primarily focused on the effect on urinary protein excretion. These limited results show consistent renoprotection (as reduction of albuminuria or proteinuria) in patients with type 1 and 2 diabetes and overt nephropathy when aldosterone antagonists are given alone or as add-on therapy to RAS blockade.31,32 Even in patients who had nondiabetic CKD and were already treated with ACEi and/or ARB, spironolactone effectively reduced proteinuria.33 In contrast, in patients with idiopathic membranous nephropathy and nephrotic proteinuria, spironolactone added to full-dose ACEi therapy did not provide additional antiproteinuric effect (P. Ruggenenti, personal communication, May 2001). In summary, a growing body of experimental and clinical evidence has accumulated to support the contribution of aldosterone as an independent and powerful mediator of renal damage. Although multiple aldosterone-mediated mechanisms of renal fibrosis have been proposed through in vitro and in vivo preclinical studies that highlight the involvement of growth factors, ROS, intracellular signals of fibroblast proliferation, and extracellular matrix homeostasis (Figure 1), a coherent, specific pathway is still unclear. Nevertheless, they provide a background documenting that attenuation of growth-promoting and other fibroproliferative effects of aldosterone contribute protection against progressive renal injury. Whether sequential blockade of RAS with ACEi or ARB and aldosterone antagonists provides additional long-term benefits to patients with chronic nephropathies remains to be seen. Because there is also concern in regard to the risk for hyperkalemia, prospective, randomized trials are necessary to confirm the efficacy and safety of aldosterone receptor antagonism on the progression of CKD. 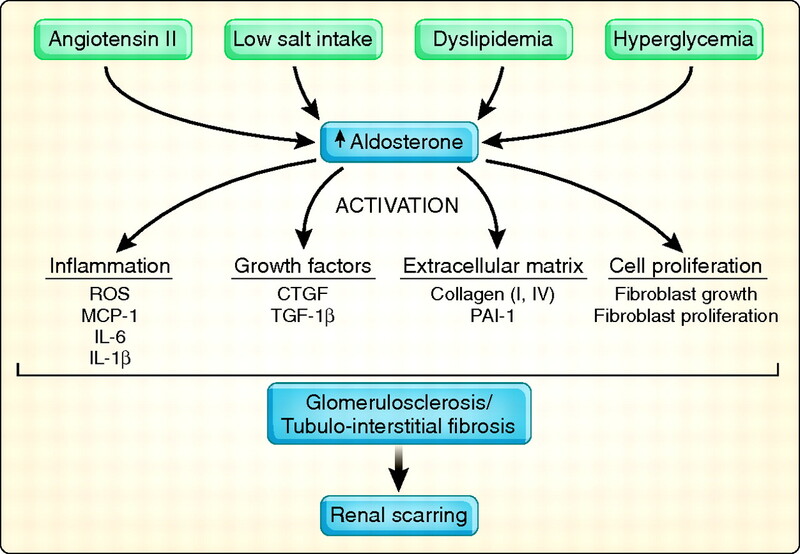 The multiple mechanisms explaining the potential detrimental effects of aldosterone on the kidney, ultimately promoting tubulointerstitial fibrosis and renal scarring. CTGF, connective tissue growth factors; ROS, reactive oxygen species; PAI-1, plasminogen activator inhibitor 1; MCP-1, membrane co-factor protein 1.